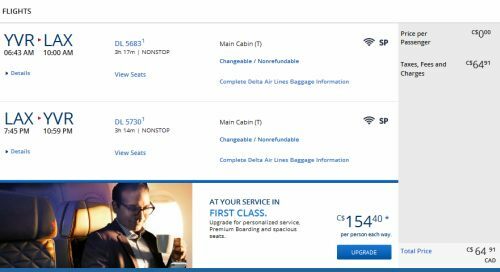 Delta has just dropped the price of their flights from Vancouver to Los Angeles, California down to $65 CAD roundtrip including taxes. Yes, you are reading that correctly. Do not adjust your set. 2. Pick some flights, and click through to Delta's website. This is not an advertised sale. It's always hard to say how long these things will last. Typically the insane price drops on Delta last less than a day. Sometimes they're gone within hours. can book the insane price now before it's gone, and then think about it for up to 24 hours. It appears to be Delta's mobile site that is giving people the most trouble, with not being able to select Canada in the billing section. You may want to try searching on a desktop if possible. 2. Click on 'English' near the top of the page, beside the little American flag. 4. Search for the flight from Vancouver to Los Angeles, using the dates you found on Google Flights. The prices are jumping up on me! This tends to happen during the mad rush of an insane airfare deal. Usually the most desirable dates sell out first. When a price jumps up during the booking process, it's a sign that those dates might be sold out. It's worth trying slightly different dates if possible. Tip: Prices on Google Flights will not be very accurate at the moment, as people rush to book their flights with Delta, affecting the live price. Try searching directly on Delta.com, using the flexible date option. Tip: In some cases, you may need to scroll all the way to the bottom of the Delta search results to find the cheap return flight. 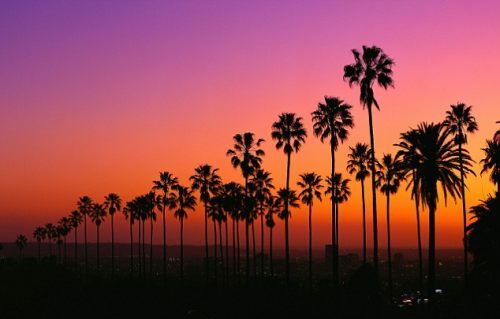 vancouver, yvr, flight deals, california, delta, united states, north america, los angeles and lax. 68 Responses to "Vancouver to Los Angeles, California - $65 CAD roundtrip including taxes"
THANK YOU SO MUCH. I just booked a trip for my cousin's wedding in June -- I didn't think I would be able to afford the ticket to attend. it won't work booking from Canada with a Canadian billing address, you'd have to change it on the home page from US to Canada before you put in ALL the details... and now that we've sorted that out there are no flights left. Boo. I booked it! Any advice if I should book hotel yet or wait, in case they cancel the booking (is this a pricing error)? Just booked a mid June flight at the $65 price. Had to adjust my dates. I just rechecked the google calendar to make sure there were still ones at that price for dates around the time I wanted. Works!! Thanks so much Chris. Unbelievable deal. Dates around the long weekend went quick. June 5, 6, 7, 8, 9, 10, or 11 to June 14.
holy! 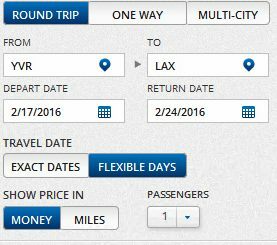 Or one way from LAX to YVR on Jan 21st etc for $5.60 including tax. That's crazy! Managed to book one way LAX-YVR Feb 2nd for $5.60 USD! Yes you read that correctly, $7 bucks total Canadian, the base fare was $0, maybe a glitch in the system but I'm confirmed with a seat too! Insane! Nice one Lila! That's pretty incredible. Just booked two tickets for mid-April (12th to 20th) and didn't have any problems with the Canadian address. The price comes up as $0.00 per person, with $65 CDN in fees/taxes. Crazy not to try! Excellent deal thanks Chris!!! May & June appear to be sold out. Any dates still available Chris? Seems to be a lot of availability when you search for ONE passenger in mid February or late February or early March. Now everything seems to be sold out. I managed to snag two of them! One for myself to go down and second flight reversed LAX to YVR for my friend to come here! When all the flights were running out it was far easier to get the reverse flight originating from LAX. Booked a Feb. round trip around 9pmPT. Google Flight showing a lot of availability, but Delta.com had limited dates for Feb. flighthub.com was showing slightly more at $71, cheapoair.ca and flightnetwork.com were showing a lot higher prices. Here's the breakdown of the fare, see the base fare $0. This is most likely a mistake fare, I hope Delta will honor. Not to be a wet blanket but this is what I would expect will happen, especially because the base fare was zero dollars which is easy to argue as a mistake. "The DOT's Office of Aviation Enforcement and Proceedings says it "will not enforce the requirement for airlines to honor mistaken fares provided the airline demonstrates that the fare was a mistake and reimburses the out-of-pocket expenses of consumers who purchased the mistaken fare,"
This came into effect May of 2015. It appears that from that point on - airlines reserve the right to void and refund purchases due to glitches. PLEASE though update this website with your status as to IF they do or do not honor it- it will give us an expectation as to what future airlines may do. I just searched and it seems like all these flights are gone :( if someone has a link to share for a flight please do... i would book in a second! did a search and don't see any cheap flights listed at all. Lowest is nearly $300. Must have all gone right away or else they fixed the price error. They were around from the time the deal was sent out, until approximately 11:00 PM PST last night. s: According to reports, Delta has said they will be honoring this fare. Historically, Delta has been quite good at honoring fares like this. Generally, if an airline were *not* going to be honoring the fare, there would be people posting about it by now. But give it until this afternoon to make sure. Usually within 12 hours of such an event, the dust settles, and it becomes clear. It would appear that the flights are NOT valid. I called Delta and they cancelled the ticket on me. I got confirmation email for my both booking. so far no cancellation! yay! Chokri: Can you explain? Do you mean that you called Delta today and tried to book it? Or you were calling them about a flight you booked last night? I haven't heard any reports of anyone's ticket being cancelled. Generally by now, if Delta weren't honoring the fare, there would be a lot of angry, upset people posting about it by now. And with this one, I do mean a *lot*, because it was a very popular one. My tickets are still valid...meaning they have not been cancelled yet. I goofed...I called Delta to confirm and they told me it was a computer error and they cancelled my flight. It was a bad call on my part, next time I'll wait for them to contact me about cancellations. Are they able to do that, just cancel the flight if they are honouring everyone else's? Am I just out of luck this time? it looks like you are out of luck on this. No one seems getting cancellation from Delta. as far as I know of including my two reservation. in the news it says, airline will try this tactic more this year to attract canucks to visit states even with terrible fx. When it comes to fares like these, the best strategy is to never call the airline. Book it online, sit back, and wait for the dust to settle. It will become clear over the next day or so whether the fare is being honored. Calling in can only lead to problems. In the case of this fare, it's been over 24 hours now, and it appears everyone's bookings are being honored by Delta. I'd say it's safe to start booking hotels, etc..
Did anyone select their seats when they booked? I didn't and am trying to select seats now but the Delta Website said to call Westjet. I'm afraid if I call Westjet, they will cancel my tickets? On the same boat as you Rich, any insight from people who were able to select their seats? Also, is it safe to say they wont cancel my flight anytime and start booking hotels as my flight dates into April. I did select them. I dont know if that makes a difference though, you'll still get seats once at the check in, right ? And yeah, you should book hotels, as you can cancel most of them with no penalties. I mean, it's up to you but I think almost a hundred percent, the tickets are valid. Did you have to pay extra to select the seats? I would think if its a Westjet flight that you would need to pay for that. I tried entering my Delta confirmation on the Westjet site but got an error for the Reservation code. Jay - I agree with Ryan that you should start booking hotels and car rentals (if needed) as long as they have free cancellaton policy. Some people bought tickets on flights operated by Delta (or Delta Connection/Compass). Seat selection is free. Other people bought tickets on Delta codeshare operated by Westjet (DL7xxx). These flights do not have free seat selection until check-in. Westjet charges for seat selection. Any idea what is the carry on allowance for these Delta flights? Delta called me saying price was error but they are honouring it. Was booked westjet to fly down and they moved us to a delta flight 1 hour earlier as she said we need to be on a delta flight due to the error. No extra charge to change flght. Seriously, Delta is asking customers to change flights after a week of getting confirmation? Are they at least they still honoring the price?? I've heard that Delta has called some people who were booked on the WestJet operated flights and asked them to switch to the Delta flights. But I've also heard it's optional, and they aren't forcing people. All prices are being honored. I just had the call from Delta as well...they have honoured the price however we are now on an early a.m. flight with Delta...they way it was positioned it didn't sound like it was optional. I got a call last night too. I asked them directly if I had the option to decline the suggested switch from WJ to Delta, and she said sure, if I wanted to leave things as is that I could. She gave me some line about wanting to "keep things under the delta umbrella in case there was a problem with the flight" and emphasized that she couldn't do seat selection for me, but the flight times on Delta didn't work for me and I'm happy to be on WJ. Hmm, no calls yet and have several booked on WJ. Ty for the heads up all! I just received a call from Delta asking me to switch to fly with them instead of with WestJet. I told her that we had already paid for seat selection with WestJet. She said that there wasn't anything they could do, so I needed to stay with WestJet (which I preferred anyway). She didn't seem that happy about it. I asked if is was going to be honoured by them and she said yes. For those who received calls, when were your flights booked for? Havent got a call, but for reference my flights are in mid April. Was there actually any cancellations in the calls or simply 'suggestions' to switch? I just got a call from Delta (9am Thurs Jan 21th), about a week after the booking. They explained my tickets were booked with WestJet, not Delta and they would need to switch me, and that they would honour the price or refund me ($0 ticket and $64 taxes...). They were able to get me a outbound flight within 15mins of my original booking, and offered me either a 8:20am or 6:55pm flight back to Vancouver (originally set for 11:35am). I wasn't happy with either of these choices, one makes me arrive at the airport at 6am and the other gets me into Vancouver too late to catch my ferry to the island. - Stick with the original Westjet flight (non-stop) back to Vancouver. I was very happy to hear it, and stayed polite (it is a good deal, and I did read up that Delta technically could cancel the ticket entirely). Worth pushing back if the re-schedule messes up your trip, but be careful, it sounds like thin ice. Darn! I wish I had been more firm with the lady I spoke with. I ended up taking the 6:55pm return flight to Vancouver. I just got a call from Delta. Looks like I booked the same WestJet flights as Jessica... 8am flight from YVR-LAX and 11:35am from LAX-YVR. The agent said they would honor the price but asked if I wanted to switch the YVR-LAX flight to the 8:15. He didn't even bother to ask me to change the return flight as there was nothing around that time but he said I could change if I wanted to. I opted to keep the return as is and changed to the 8:15 flight from YVR as I can select seats for free and I get free checked bag because I paid with my Delta AMEX card.. I'll just have to pay for seats and bags on the return flight. My caller ID says that I missed 3 calls from 8002211212 on 1/20. After I saw these posts, I did a google search on that number, sure enough it was Delta! They never left me any voice messages. I'm glad that I've never answered their calls, because I already booked connecting buses from LAX. Just returned from an amazing weekend in Santa Monica. What a great weekend away for $65RT! I, too, received a call about switching our Saturday 8am WestJet flight to a Delta flight departing at 6:45am. The woman asked me to call back and rebook, but I ignored this request and we stuck w/ the 8am flight. For our flight home from LAX last night, we were automatically rebooked onto Delta Connection flight that departed at 7:55pm instead of the WestJet 7:35pm flight, which wasn't a big deal. Other than the annoying bit where we couldn't check in until arriving at YVR for the WestJet flight, everything went smoothly and we were very happy 1st time mistake fare flyers! Muchas gracias Chris! Keep up the great work! Thanks Alex! I'm sure many others appreciate the info, and I'm glad you had a great trip. Just got a voicemail from Delta today letting me know that they rebooked YVR-LAX on May 5th from departure of 8:05a on WestJet to 8:15a on Delta. They didn't change the LAX-YVR return; on that, I'm still on WestJet. They did say the flight deal was a system glitch but that they were going to honour the prices. Thanks so much for this amazing deal! Yes I got the call from Delta too, and the way she said it made it seem like she had to change the Westjet flight to a Delta flight because of the fare we got. I was scared they were going to tell me the fare wasn't legit! so I was happy to hear the flight they wanted to put us on was just 15 min later.. From 8:00 to 8:15. And since it is now a Delta flight instead of WJ, I chose the seats online for free.